This special Pu-erh was harvested from arbor tea trees in Xishuangbanna. Like all raw Pu-erh, it was processed through kill green (sha qing), then dried in the sun - this arrests enzyme activity in the leaf allow the tea can be aged. 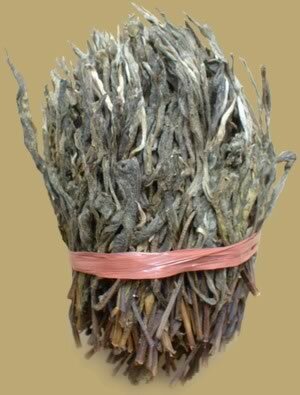 The tea with shinny luster, rich aroma and smooth taste. Jiuwan has released this Pu-erh in loose leaf, keep tea leaves in good appearance. You don't have to break cake or brick when brewing, it's a convenient way to enjoy a nice raw Pu-erh. PREPARATION: To prepare Loose Leaf Raw Pu-erh, place about 3-5 grams of leaf per serving in a teapot. Rinse by covering with boiling water and quickly pour off. Fill with boiling water again and let steep 5-30 seconds (depending on how light or dark you want the tea) and serve. Pu-erh tea can be steeped 10-20 times.